Hand Made Soor Plooms - You can tell from the vibrant colour (apparently, that`s down to the temperature during the boiling) and imperfection (in a good way!) of these little beauties that they`re hand made by an artesan. And let me tell you - they... More..
Watermelon Chunks - Yes, we know we already have Watermelon Slices and Sour Watermelon Slices, but we just couldn`t resist these - and we just love the summery taste of watermelon here. The taste is exceedingly fresh and watermelonny, with a lovely ... More..
`Northern` Pear Drops - what makes them Northern? Well being a Southerner I had never seen Pear Drops like these before. Daaan Saaath pear drops are either pink or yellow. These are pink and yellow in the same sweet - still with the traditional deli... More.. Sour Strawberry Bites - strawberry on the outside, smooth on the inside, with a sour sugary coating. They are chewy. . . and really, really good!! - Qty In Order: a quarter of a kilogram - just over 8.8 ounces... More.. 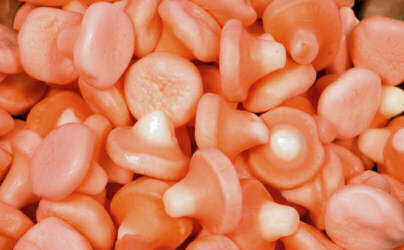 Strawberry Millions - These little beauties are positively bursting with juicy strawberry fruitiness. They look like little nuggets of bubblegum, but they are infact little nuggets of chewy-scrummyness. They`re small (so last for ages... unless lik... More.. Strawberry Foam Mushrooms - some people prefer the Malaco Foam Mushrooms that we sell and some prefer these which are smaller, softer and have a really strawberry-ey taste (did I get away with that??). They are very very very moreish. - Qty In Order... More.. Sour Tongues -slightly sour tongue-shaped fruity chewy sweets. If you`ve ever wondered what a tongue tastes like, this is your chance to try! ( - not really) - Qty In Order: a quarter of a kilogram - just over 8.8 ounces... More..
Blackberry and Raspberry Domes - these are really moreish - .lip-lickingly fruity jelly blackberries and raspberries with a crunchy layer of little sugar balls. A taste of late English Summer - but without the wasps! - Qty In Order: a quarter of a k... More.. Giant Strawberries - These are fabulous, and rather tasty too: large, juicy strawberry jelly gums that have been around since the 70s and were regulars in little white paper bags up and down the country. Why were they so popular? Well, because they... More..
Hand Made Sugar Free Soor Plooms - For those of you who can`t have or choose not to have sugar, this is a real treat for you!This is the sugar free version of our fabulously tasty hand made Soor Plooms - these are every bit as delicious - we can`t te... More..